In this section, you will find a table with the models of laser protection filters suitable for the power or energy of your near infrared laser (NIR: 700 nm to 1400 nm, around 1 μm laser emission included). The German manufacturer of laser protection and safety eyewear, Protect Laserschutz, designs and manufactures both, the plastic and glass laser protection filters of the laser protection glasses, as well as the frames (laser protection goggle frames also protect against laser radiation and are certified according to the corresponding standards). 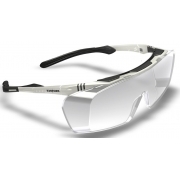 The table includes the level of laser protection, the visible light transmission (VLT), the color of the filter and the frame of the laser protecion glasses. They are divided into glass models or plastic polycarbonate models, the later one cheaper than glass but easier to scratch. 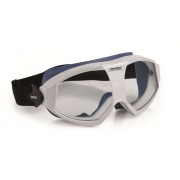 Click on the box immediately below to download the document ("Download" tab), where you will find the summary of all near infrared laser protection goggle models (NIR-1μm). At the end of the document, you will find pictures of all available frames.